For anybody who didn’t play video games during the 8-bit home computer era, the era of five minute plus tape loading times (or not much faster if you were lucky or rich enough to own a 5¼inch disk drive), loading screens might need a bit of an explanation. When I say 8-bit, I mean the 8-bit home computers popular in Europe during the eighties. Primarily the Sinclair ZX Spectrum range (released with only limited success in the US by Timex), the Amstrad (or Schneider) CPC range, and the internationally popular Commodore 64. Tapes were the primary European distribution method for games on each of these platforms. Disk drives existed for all but the Spectrum, which although faster and more reliable than tape never really took off as they were too expensive. In the US the 8-bit machines are generally considered to include the Atari 400 and 800 range and exclude the relatively unknown Spectrum and Amstrad machines, and disk distribution was much more common, so perhaps loading screens weren't quite so important in North America? Put simply they were full screen pictures which appeared soon after a game began loading, and stayed on screen until the rest of the game had loaded into the computer’s memory from tape or disk. Technically they actually made the loading process slightly longer than necessary, as they constituted additional data which wasn’t part of the game itself and needed to be loaded into video memory first. In the case of a 48k ZX Spectrum game the loading screen itself would be around 6k, representing an increase in loading time of about 13% over a the same game without a loading screen. A blank screen was no fun though, and loading screens served a valuable purpose giving the player (we didn’t have the word “gamer” back then) something to look at during the interminable wait for the bloody thing to start. That’s if they hadn’t gone for a cup of tea, or to make a slice of toast, or read another chapter of War and Peace – activities which always seemed to increase the chances of seeing the dreaded R: TAPE LOADING ERROR instead of the title screen after the tape had finished playing. Loading screens had a greater significance than this raw, time-marking function might suggest. Parallels are always being drawn between video games and other entertainment media such as music or films, and in most cases they serve only to demonstrate the author’s lack of understanding of the unique features of video games rather offering any new insights into this medium, so I’m wary of falling into the same trap, but I’m going to risk using an analogy from pop music which I believe will be helpful in this case, and say that loading screens were the album covers of their time. Of course, video games already had covers – or inlays as they were more commonly known in the case of cassette tapes – usually containing a picture and a title logo, so it would be obvious to consider the inlay the equivalent to the cover of an album, but I think this would be inaccurate. Album covers became (perhaps from around some time in the 60s, but I’m no music historian) a far more important part of any pop music album than merely a protective sleeve for the vinyl or a label for the contents. They were part of the experience of that album, often being considered important artistic works in their own right, and in the best cases designed to compliment and accompany the music the artist had created. People would hold and look at 12” album covers whilst listening to the record itself, something which probably doesn’t happen so much these days with CD inlays, and not at all with downloaded music. A typically poor example of cover art from one of our games of the time. Whilst not a bad image in itself, it doesn't capture the look or feel or atmosphere of the game in any way, and seems like the work of an artist who must have had the idea of the game described in one sentence over the phone. At this stage in the evolution of the video game industry cassette inlays were anything but the equivalents album covers. Whilst video games were becoming a lucrative business there hadn’t developed yet either a widespread respect for the customer (“It doesn’t matter, it’s only for kids”, was a phrase often used at the time without irony), or much respect for the products themselves as creative works. At least not amongst any of the publishers we worked with! Cover art was commissioned by the publisher with no input or involvement from the development team, and in most cases (it seemed) with the hired hack illustrator never even seeing the game the cover was supposed to represent. 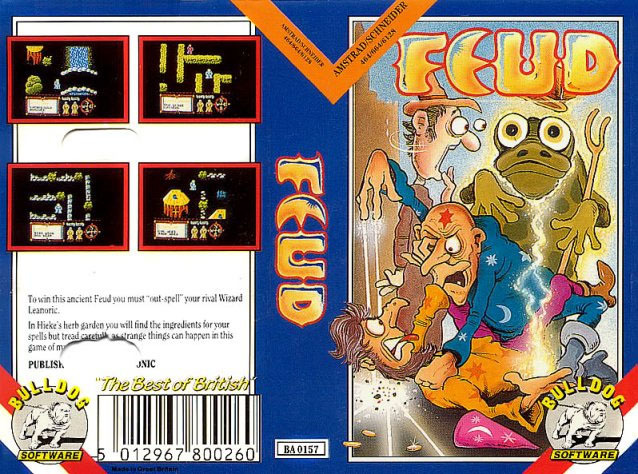 Even the rare nice examples of cover art were considered misleading, giving the impression that the usually rather primitive game inside would look something like the amazing visuals on the cover, leading to disappointment and a general disbelief in cover art. A relatively rare example of a good quality cassette inlay cover from an early Quicksilva ZX Spectrum title. Ironically this sort of high class artwork often led to disappointment when the visuals within the game didn't match up to the promise of the cover. The frequently poor physical quality of the cassette cases and inlays themselves (the boxes would easily break or the inlay would get lost), and the established status of cassette tape as a temporary medium, as well as the fact that the cassette itself didn’t actually need its case to survive all meant that the game’s packaging was less likely to be treasured in the same way that that an album in its sleeve was. 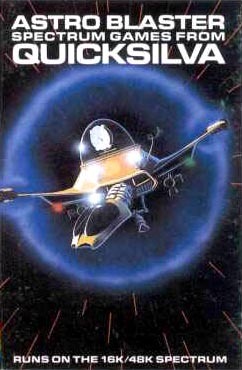 And perhaps the ease and popularity of home copying – getting twenty games on a c90 from a friend was most people’s introduction to home computer gaming – further devalued the cover, as a significant proportion of the players of any one game will never have even seen the original cover artwork. No, the cassette inlay was a poor quality, badly produced, throwaway piece of tat whose only purpose was to draw your attention to the box on the shelf. It wasn’t an integral part of the product in the same way that the album cover had become. That role was taken up by the loading screen. And like a good album cover, a good loading screen was designed to be looked at for long stretches of time (well, five consecutive minutes at least). Sure, this was filling time before the experience proper began, rather than accompanying the experience as in the case with music (listening to the sound coming out of the tape deck wasn’t as entertaining with video games), but by demanding your time they imprinted themselves on your memory in the same way an album cover did. The best loading screens teased and hinted at the thrills in store for the waiting player, and helped build up the tension and excitement. In those days, with only somewhere between 16k and 64k bytes of RAM available for a game, the loading screen was the only chance the player got to see ‘big’ graphics; the best possible images that the player’s expensive, high powered home computer system was capable of producing. No game could afford to dedicate something ridiculous like over 10% of its available space just to a full screen image within the game itself, not without significantly reducing space for the rest of the game’s visuals. RAM, or the lack of it, was always a massive issue for game developers working on these systems. Even apparently simple games had to be shoehorned into the tiny area of memory available with almost insane levels of ingenuity and compression. A game like Jet Set Willy would reduce the data needed for a full screen level to just a few bytes by cleverly storing only the data to construct a screen from patterns of character sized blocks rather than storing the screens themselves, and I remember an instance of a fighting game on the Commodore C16 (a machine released after the Commodore 64, with only a quarter of its RAM) where memory was so scarce that some of the code itself (the instructions for running the game) were stored hidden within the blue sky (paper blue / ink blue to keep the instructions invisible to the player) and white clouds (paper white / ink white) on the game screen itself, with jumps in the code to bypass the graphical edges of the clouds. In practice we could rarely afford to spare more than 16x16 or 32x32 pixels for any in-game graphic, but the loading screen was an opportunity to draw something big, giving these images a special significance for the artists involved. The basic skill of a video game artist at the time was the ability to make something decent looking, or at least recognisable, in a grid of 8x8 or 16x16 pixels. This certainly took skill, and perhaps a degree of craftsman ship to do well, but most of the work of a video game artist couldn’t really be called ‘artistic’. Some big artistic decisions needed to be made on each project which massively influenced the look of the game – colour schemes and colour palette selections, screen layouts and control panel designs, and in some cases map or level design (although by no means all games had designed levels as such) – but most of the time what an artist could create for the game was strictly limited by what the programmer dictated. Three colours for all sprites? 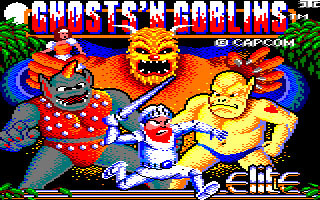 On the first game I ever did graphics for (Ghosts 'n Goblins on the Amstrad CPC) the programmer allowed me only three colours to draw all the sprites (moving graphics) in the game with, and only four colours per level (including black) for the backgrounds. This was in the low res chunky pixel mode which normally allowed a rather nice 16 colours on screen. 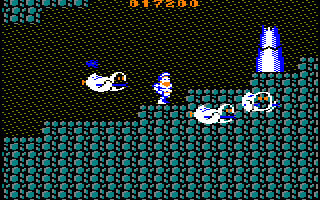 The limitation was to allow a programming trick to speed up the scrolling, but the result was a plain looking ugly game, far inferior to the nice looking C64 version. Even years later I'd hear “Urgh! You did the graphics for that?”, when I mentioned this game was one of mine, but compare the in-game graphics to the loading screen, where I had free reign. “You have four frames for the run cycle”, “You have three colours for all in game sprites”, “Each baddie can only be 16x24 pixels”, etc. Most programmers weren’t artistic and most artists had little knowledge of the technical difficulties of programming a game (so not much has changed in that department!). The result was frustration on both sides, but the programmers were firmly in control in those days and the artists were the inferiors, the junior partners, support staff who had to do what they were told. An artist’s reputation and career prospects could be affected by a bad looking game, but the artist actually had a very limited influence on the look of a game; the key decisions were the programmers’. The loading screen was different though, it was exclusively the artists’ domain. Nobody could dictate the size or number of colours available – that was limited only by the hardware’s capabilities, and in some cases (such as with the Amstrad CPC) the artist even had a choice of screen resolution and colour depth, regardless of what the programmer had chosen for the game itself. It was a chance for the artist to flex their creative muscles and show off their artistic abilities, a chance to really make their mark on a game, and make a small part of it their very own. Some of us relished this opportunity and considered it the most enjoyable part of the development process (although not the most important – the game itself with all its compromises and limitations was always the most important thing) and did perhaps some of our best work here, but some artists were absolutely hopeless at loading screens. It was a young industry, most of us making games at the time were only kids without much training or experience, and one of the key qualifications for being a video game artist wasn’t so much artistic ability but simply the ability to operate a computer. There was nothing fashionable about home computers in those days. Being ‘into’ computers enough to be able to operate them to the level an artist needed usually required a level of ‘geekiness’ which excluded most people with any artistic aptitude. In fact a good many artists were either failed programmers (as the programmers liked to remind us, despite our feeble counter that the programmers were really failed artists! ), or wannabe artists who hid their lack of talent behind the fact that its hard to see just how bad somebody is when you only have 16x16 pixel images to judge them by. With a full screen to fill there was nowhere to hide. Layout, colour balance and composition were all considerations for loading screens, skills which weren’t really required for in-game graphics work, and as a result there were many examples of the ugliest and most amateurish artwork imaginable gracing the first five minutes of otherwise perfectly acceptable games, illustrating the lack of talent of many professional artists employed at the time. A good example of Melbourne Draw’s amazing new zoom function in action. Even once we had zoom as standard, none of the art packages I ever used on the 8-bit machines had an undo function. Dpaint on the Amiga would be my first experience with this luxurious, but now essential feature. Read more about the graphics tools and limitations of the ZX Spectrum in this excellent Crash article. Well, that’s one excuse for the low standard of a lot of loading screens, but it’s not the only one. The poor quality of the tools available was a factor as well. The definitive 2D art package for video game development – Deluxe Paint – was years away, and something of the power of Photoshop hadn’t even been imagined. I’d heard of something called Quantel Paintbox and even seen it in action on Tomorrows World, but high end TV production tools were a million miles away from what we had in the home computer world. My own first experience creating computer graphics was with a full screen pixel editor written by my brother on the ZX81 which didn’t even have a save function. We kept copies of the images we liked by recording them onto video tape! Tools had progressed by the time I was drawing real loading screens, but all my first efforts were created using full screen editors without a zoom function. That’s right, no zoom! I edited pixels at their actual size on screen, viewed on a 14” TV (that’s a TV, not a monitor) with blurred, interference laden RF input. Creating loading screens meant sitting hunched over the desk squinting at the screen, trying to see where my single flashing pixel cursor was in the mess of blurred colour. The first art package I used with a zoom function was Melbourne Draw on the ZX Spectrum (by Melbourne House, part of the tradition later continued by Electronic Arts with Dpaint of the best tools being created by development studios themselves) which revolutionised what I could do. Two of the Ultimate Play the Game loading screens, which were better than anything I'd ever seen when they were released in 1983. Their secret? Graph paper! Before I ever worked on a real video game I did tens of ‘virtual’ loading screens for existing games; games I hadn’t played or couldn’t afford yet, or had only seen in advertisements. 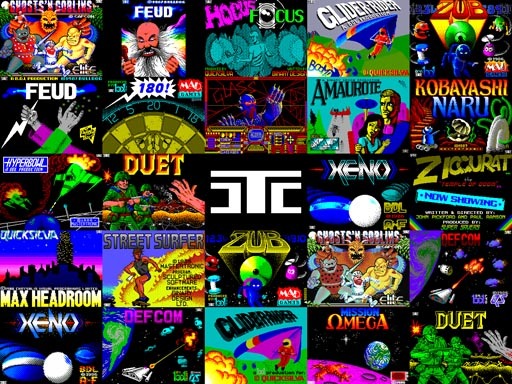 All of these are lost forever now, but I’d spend hours after school copying a game advert or cover art, adapting it to best fit a ZX Spectrum or Amstrad CPC screen layout and fitting the colour scheme cleverly into the attribute squares. My biggest inspirations during this period were the wonderful loading screens for Ultimate Play the Game’s ZX Spectrum games. To my eyes these were truly amazing. Not only were they incredibly complicated and perfectly executed, they matched superbly both the cover art and the in-game graphics (in a rare example of good quality cover art being created by the same artist who did the in-game graphics). We used to speculate about the mind-bogglingly powerful art package the secretive and mysterious Ultimate team must have access to. We found out when we worked with them in their later incarnation as Rare that they did all their graphics on paper, and I even saw with my own eyes the graph paper original of the Cookie loading screen – coloured by hand with felt tip pens and then typed in, byte by byte. I don’t know if this makes their loading screens more amazing or less. So there were, like anything else, good and bad examples of loading screens, but much more so than the more functional title screens of modern games or contemporary ROM based games (where the instant boot-up removed the need for a loading screen), these images were a unique and important part of any cassette based game of the time. The best loading screens ignited the player’s imagination and stoked their anticipation during those long slow minutes before the game could begin. They were the best possible graphics the computer could produce, and probably the single most artistic element in any particular game. 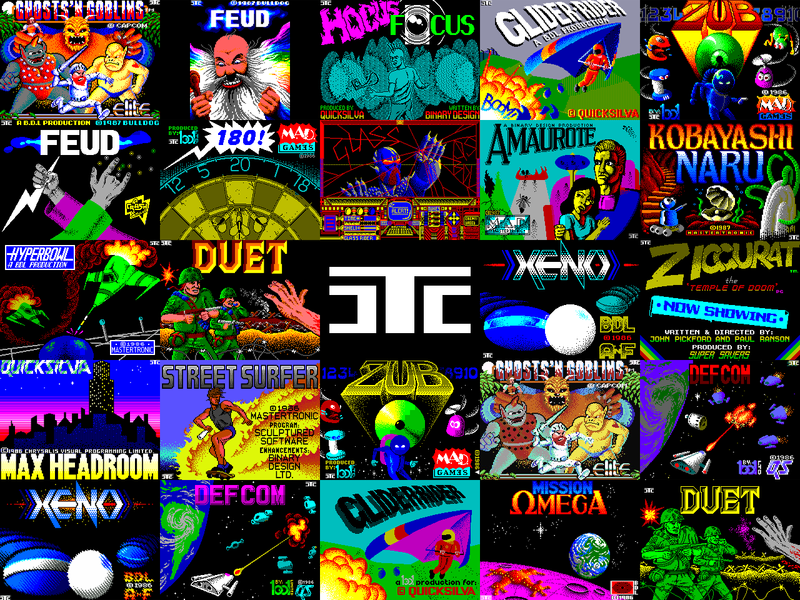 Because of pitiful production values of cassettes and their inlays and the prevalence of the home made C90 compilations, loading screens were the de-facto covers for home computer games. They were a big deal – the album covers of their time. They look pretty crappy nowadays compared to the expensive, near Hollywood quality team produced rendered FMV sequences which introduce many modern games, but I think it’s a shame we don’t have an equivalent moment of unfettered individual artistic expression in the multi-million dollar games of today. Loading screens were an important part of any 8-bit cassette based video game, and for me as a budding graphic artist at the time drawing them was my favourite part of my job. Before I ever did any real work, I'd spend hours at home drawing loading screen type full-screen images on my brother's Spectrum, usually copies of game adverts or cover artwork, and although I say it myself they were usually much better than the ones on the games themselves, often with mind bogglingly complex attribute layouts. Sadly I never thought to keep any of the tapes I filled with this kind of work, so they are all lost forever. For a period of around two years starting in 1986 I drew about one loading screen a month, as well as all the other game graphics, and ended up getting a bit of a reputation as a loading screen specialist. I remember thinking that this little design was really clever at the time, and I even signed all my work in art lessons with the same symbol (much to my art teacher's annoyance). I don't use this signature anymore, and because we rarely got credit within the games themselves in those days, the symbol seems more like my loading screen signature now. I loved the free and easy attitude we had to legal notices in those days, before US-style corporate lawyers began to dominate the industry. Copyright messages may or may not have been included in the screen, usually at the whim of the 16 year old lad drawing the artwork (or whether or not there was screen space available) and not a trade mark notice in sight (except for the ironic one on my very first loading screen). 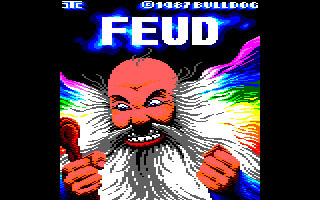 For a lot of games I did loading screens for all three main 8-bit platforms; ZX Spectrum, Amstrad CPC and Commodore 64. Wherever I did both an Amstrad CPC and a Commodore 64 screen I've only included the Amstrad one, as the original would have been drawn for the Amstrad then converted to the C64, resulting in a virtually identical image except with crappier colours. The ZX Spectrum version was always a completely different piece of work, due to the different screen resolution and colour system, so I have included Spectrum images in addition to Amstrad versions.